In 1836, the young architect Jean-Pierre Cluysenaer, born in the Netherlands in 1811, had the idea to construct a covered gallery of more than 200 meters that would directly link the "Marché aux Herbes" (herbs market) to the "Montagne aux Herbes Potagères" (vegetables market), by demolishing a number of sordid alleys in which the bourgeoisie did not dare to come. On the 22nd of February 1845, the City Council, presided by Burgomaster Wyns de Raucourt, found a large majority in favor of the project. On the 3rd of April, a royal decree allowed the works to begin, three months before the "Société des Galeries Saint-Hubert" (the Company of the Saint-Hubert Galleries) was founded. The conceiver of the project and the bank manager Jean-André De Mot, who was the father of Emile De Mot (the future burgomaster of Brussels), were members of the company. It took nine years before the administrative and financial formalities required to proceed with the numerous expropriations were completed. The construction of the building itself lasted one year and a half. These expropriations provoked a lot of complaints and even a few tragedies. An old lady of rich descent that lived in the "Maison des Orfèvres" (goldsmith house), at the present entrance in the Rue du Marché aux Herbes, died of panic and anger when the bailiff came to announce her that her house was to be demolished shortly. What remains of this house is the ancient motto : "Omnibus Omnia" (all for all). Mister Paneel, a barber by trade, obstinately refused to leave and preferred cutting his throat with a razorblade rather than watching his houses being destroyed. When the construction was already in an advanced phase, the first stone was laid with a golden trowel by King Leopold the First, accompanied by his two sons. At the meeting of the board of the company on the 4th of December 1846, the names of the three parts of the new gallery, to pay homage to the royal family, were agreed upon : the Galerie du Roi (the King's gallery) to the east of the Rue des Bouchers, the Galerie de la Reine (the Queen's gallery) to the west, and the Galerie du Prince (the prince's gallery), a 54 meter long gallery that links the Galerie du Roi to the Rue des Dominicains. In October 1965, the building, originally called "Passage Saint-Hubert", received its present name "Galeries Royales Saint-Hubert". This collective name comes from the old Rue Saint-Hubert that linked the Rue du Marché aux Herbes to the Rue des Bouchers. This narrow street already existed in the 13th century, but it was called "Bogart" or "Bomgaard" (orchard street). It has also been called "Spiegelstreetken" (Mirror alley). The name of Saint-Hubert appears in 1685 (St Huybrechtsstraet), because of a cabaret dedicated to this Saint. The cabaret was very often visited by the "échoppiers" (stall keepers) of the nearby Marché aux Herbes. During the French regime, it was called "Rue du Chasseur" (hunter street). 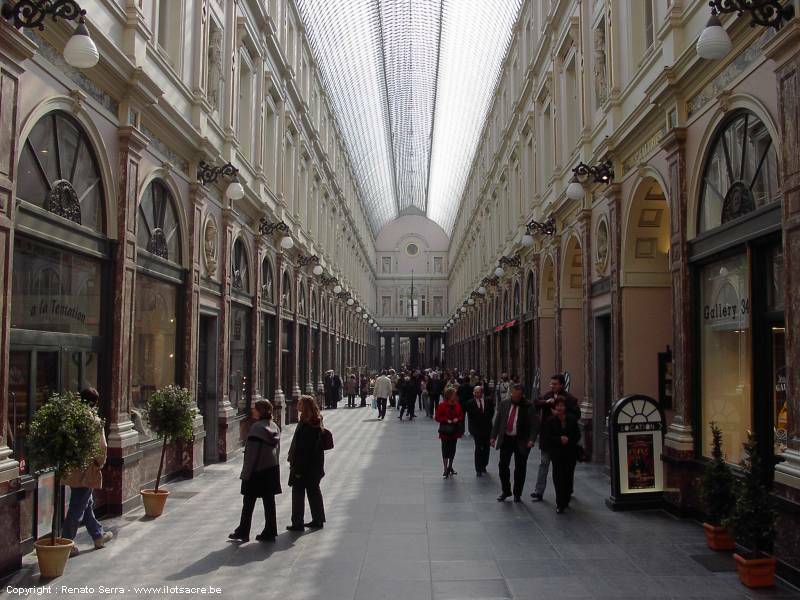 In the middle of the 19th century, the Saint-Hubert Galleries were the longest, highest (8 meters), best decorated and best lit galleries in the world, thanks to the enormous glass roof which is 200 meters long. From the day of their inauguration, these galleries have been highly successful and entertaining. Later on, the luxurious specialized shops added their part to this success. The "exterior" terraces of the cafés, cake shops and ice cream sellers attracted a smart public that came there to forget the humid Belgian climate for a few hours. 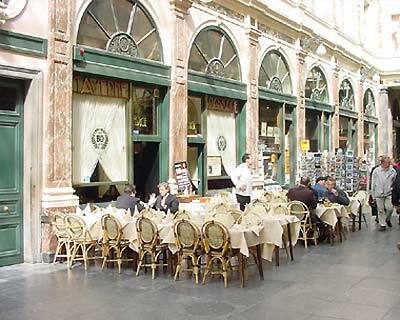 During the years, the Passage Saint-Hubert became a literary centre, where one could meet famous French writers such as Baudelaire, Alexandre Dumas, Victor Hugo, Apollinaire or Verlaine in the "Café de la Renaissance" (the present "Taverne du Passage"), which was the meeting place of the Artistic et Literary Circle. Nowadays, the galleries still are an important commercial centre for luxury goods in an old-fashioned environment that was recently restored with a lot of care. Among the remarkable shops, there is the number 23 of the Galerie de la Reine, where the Swiss Jean Neuhaus installed a confectioner's shop in 1857. Neuhaus was specialized in making cough bonbons, marshmallows and liquorices for stomach pain. His son Frédéric made delicacies such as chocolates filled with vanilla. In 1912, Jean Neuhaus introduced a number of novelties, such as chocolates filled with fruits, crushed nuts paste, various sorts of creams and even liquors. He called them "pralines", because their form looked like the grilled nuts covered with sugar of the Marquis of Praslin. One fine day, his wife came up with the idea of putting the pralines carefully in a little cardboard box, because she was tired of serving them in a paper wrapper. They called this cardboard box a "ballotin". Since the beginning of the previous century, number 31 has housed the renowned Belgian leather shop Delvaux, creator and manufacturer of the most refined traveling-bags, trunks, handkerchiefs, purses, and various leather objects. On the side of the Galerie du Roi, on number 7, during the Belle Époque, the newspaper "La Chronique" was housed. In one of the rooms on the first floor, the first Belgian public cinema show of the Cinematograph Lumière was organized on the 1st of March 1896, only a few weeks after Paris. This cinema show included "L'Arroseur arrosé" (The Sprayer sprayed), "Le Repas de Bébé" (The Baby's Meal) and "Le Train entrant en Gare" (Train entering Station). Cultural life was present in the galleries as well. In the Galerie du Roi number 32, one can still find the Theatre of Saint-Hubert Galleries, that was conceived by Jean-Pierre Cluysenaer himself and inaugurated on the 7th of June 1847. Originally it was used for comedy, drama and vaudeville. In fact, the City Council of Brussels had forbidden singing or music, in order to prevent it from competing with the "Théâtre Royal de la Monnaie". The first spectacle that was organized in the new hall was a "phantasmagoria", followed by a revue. In 1849, it changed its name to the third "Theatre Royal" of Brussels, after the Theatre Royal de la Monnaie and the Theatre Royal du Parc. From 1860 onwards, the theatre was allowed to stage operettas and revues with orchestra. Thus began a long era of revues, with or without music, that were enormously popular with the Brussels audience. In 1951, the hall was completely demolished as it had become too old and no longer complied with the new standards of security. A new and larger hall was built in no time, with two broad balconies in the middle, instead of the previous four narrow peripheral galleries. The Theatre Royal des Galeries still has an enormous success, and its famous "Revue" keeps attracting a large audience. The Galerie de la Reine also sheltered another theatre called the "Vaudeville". It was located on number 15 and had 750 seats. It was inaugurated in 1884. Originally it was a covered flower market, quickly followed by cabaret that was first called "Casino Saint-Hubert" and then "Bouffes-Bruxellois". This hall was in its heydays between 1947 and 1970. Later it was transformed into a private club. 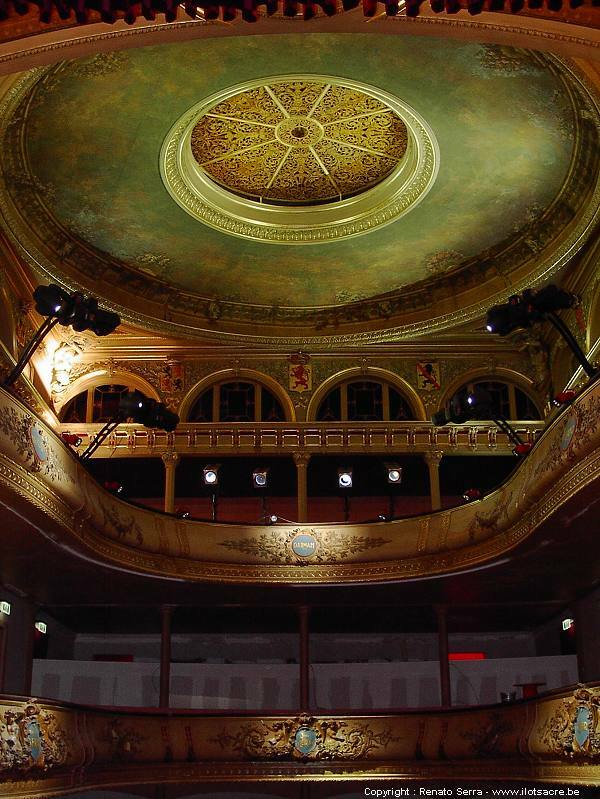 The Vaudeville was recently restored and is now used again as theatre and reception room.